The Seawolf uses a pump driven ballast system to execute dives in a static manner. This design means that the robot can dive and ascend vertically. It is much more useful than hydrodynamic diving that uses fluid movement to dive and rise. The Go-Pro versions like Hero 3 or Hero 4 are perched on an acrylic nose fitted into Wolf’s highly compact hull. It can reach a maximum depth of ten meters and operate at a speed of 1.8 knots. The 5,000 mAh battery ensures a good battery timing with the wolf having a steady fifty minutes battery. Another plus point in the development of Seawolf is that it is being introduced in three different versions; F11, F12, and F13 models. F13 uses a dangling cable to transmit signals underwater. The wireless versions F11 and F12 don’t require it as they communicate via a Wi-Fi buoy that is floating at the top of the surface. It relays instructions to the parent device that can either be an LCD or a smartphone. This flexibility of the submarine drone is particularly useful while doing offshore photography. 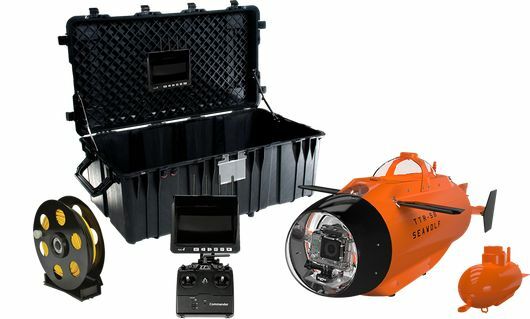 The price range of the Seawolf is much lower that of other competitors like Aquabotix Hydroview that costs in excess of 3,000 dollars. 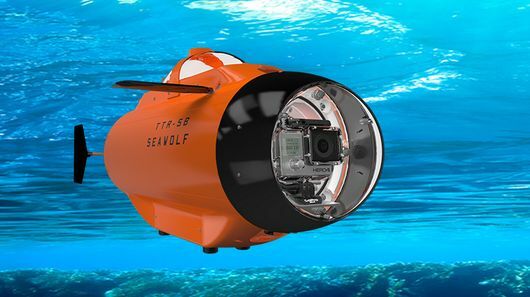 The Seawolf is expected to cost around 999 $ initially. Marine wildlife photographers will be drooling at the very sight of this nifty submersible.